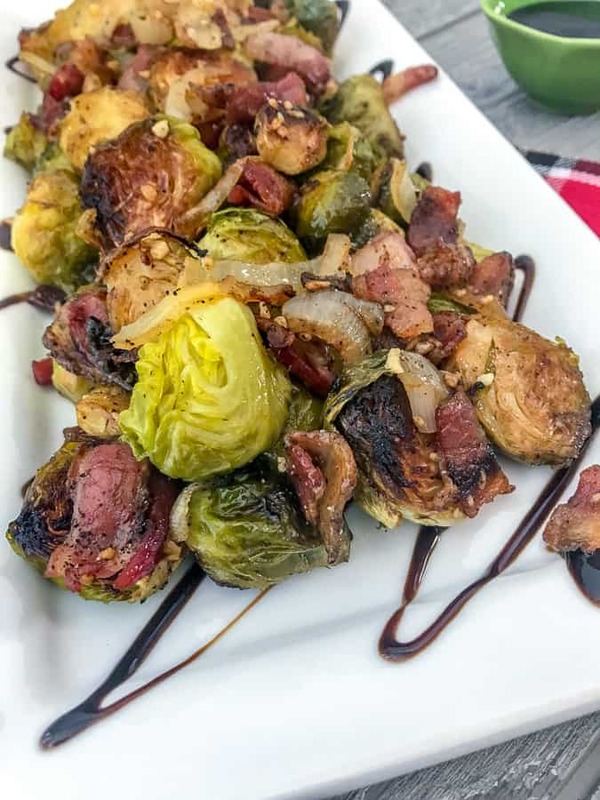 Roasted Balsamic Brussels Sprouts – made with bacon, garlic, onion, and a delicious balsamic glaze. 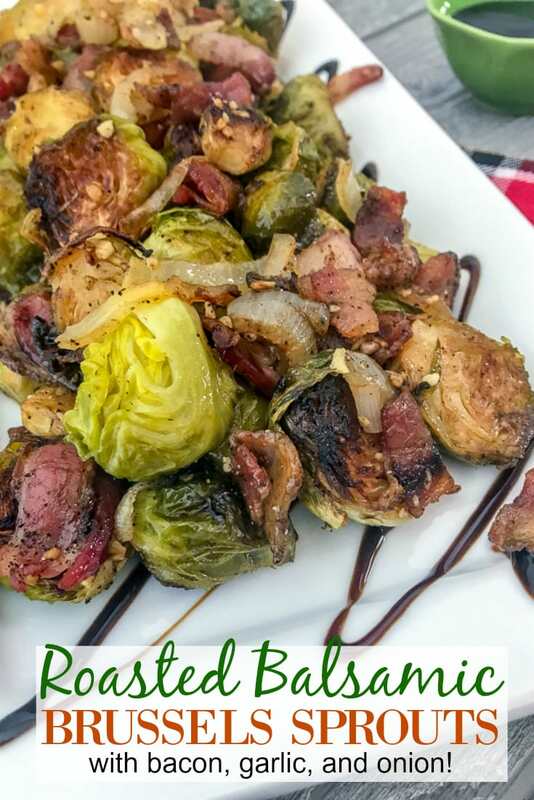 This makes for an incredible side dish for your upcoming holiday festivities! It is full of flavor, easy to prepare, and sure to be gobbled up by family and friends in no time! Guaranteed to be the new way you enjoy brussels sprouts! 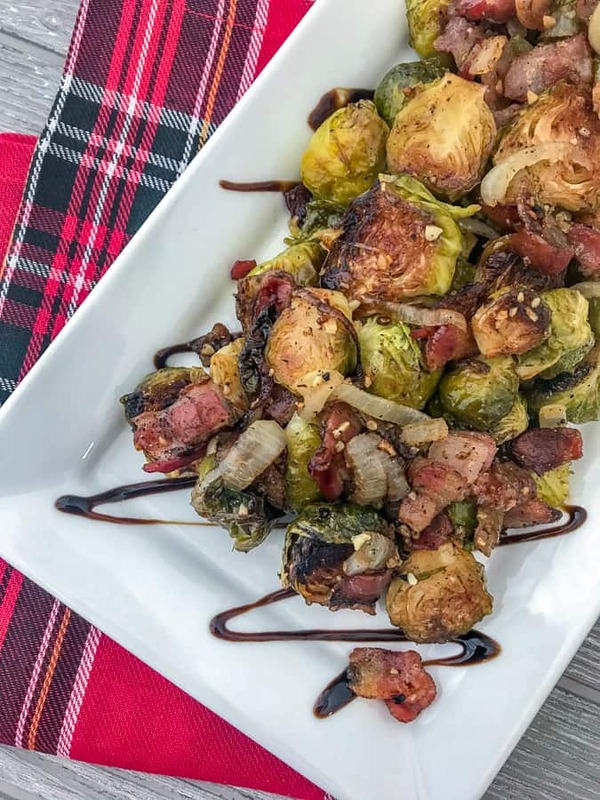 Stop eating boiled brussels sprouts and try them roasted and even with balsamic glaze! They are the way to go when it comes to enjoying this increasingly popular vegetable. No more boiling until they are bland, boring, and soggy. This dish is the new way to go – even without the bacon for those trying to watch their figure! 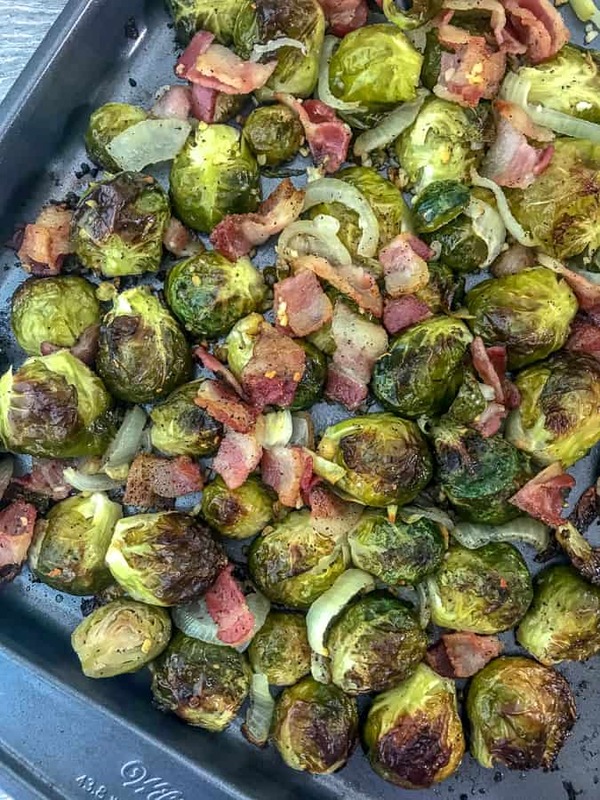 For those marching directly into this holiday season with gusto – include that bacon and wow your guests with this side dish. It is so easy to prepare and bursting full of sweet and savory flavors. So delicious, you’re going to wonder why you didn’t start making something like this years ago! VERY easily. Cut the rough, root edges off of each sprout. Remove any yellowed or bad outer leaves. From here you can leave them whole or slice them in half. I prefer them sliced in half and to roast them cut-size down to achieve that crispy, roasted edge. I feel that it only enhances the flavor of the brussels sprouts this way. But its entirely up to you! Trust me and try it (just once) this way! 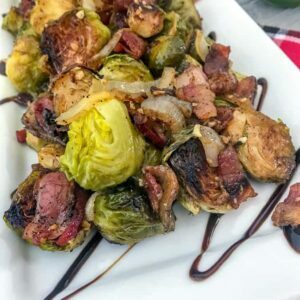 These Roasted Balsamic Brussels Sprouts are delicious with any meal, whether it be a baked chicken dish, a honey baked ham, or pair it with my Easy Tender Instant Pot Turkey Breast! Honey Roasted Butternut Squash – sweet and savory, bursting full of fall flavors! Roasted butternut squash, freshly roasted cranberries, and honey-brown sugar roasted pecans; all topped with fresh, crumbled feta cheese. Garlic Parmesan Skillet Rolls – soft, fluffy, and absolutely perfect. Made with homemade bread dough, baked to perfection and topped with a garlic-herb butter and parmesan coating. You will have a hard time having just one! Simple Traditional Herb Stuffing – made from scratch! Crispy on the top, yet soft and fluffy on the inside, just the way stuffing should be. Full of herbs and vegetables. Creamy Mashed Sweet Potatoes – looking for an easier way to make your sweet potatoes this year? Try this method and have them on your table in 25 minutes or less! Cheesy Hasselback Potatoes – hasselback potatoes with an au gratin, cheesy twist! A gorgeous side dish that will compliment any holiday table spread and guaranteed to please the entire tables taste buds. A sweet and savory side dish that comes together easily! Perfect with your holiday ham or turkey, as it is guaranteed to please your guests taste buds. Preheat oven to 400 degrees F with rack placed in center of oven. Coat a baking sheet generously with nonstick cooking spray. 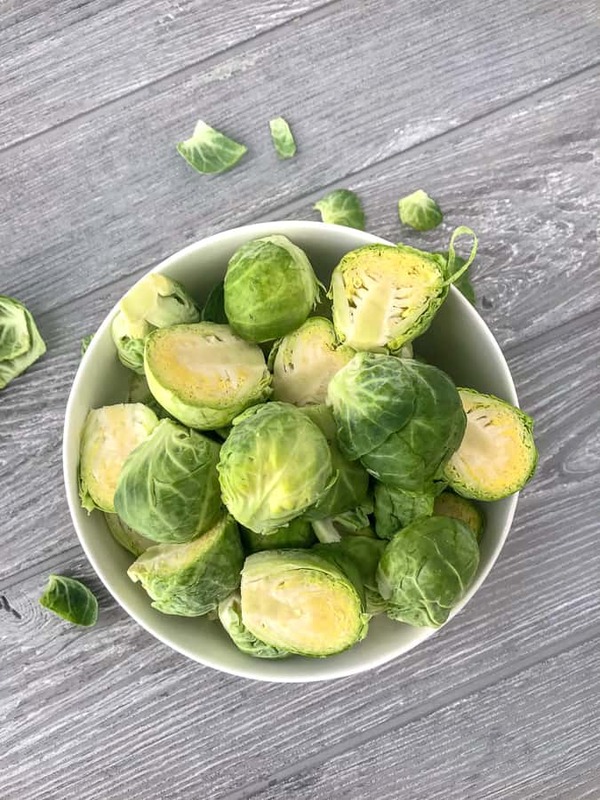 Slice the root ends off of each brussels sprout and slice in half. Remove any brown, yellowing outer leaves. 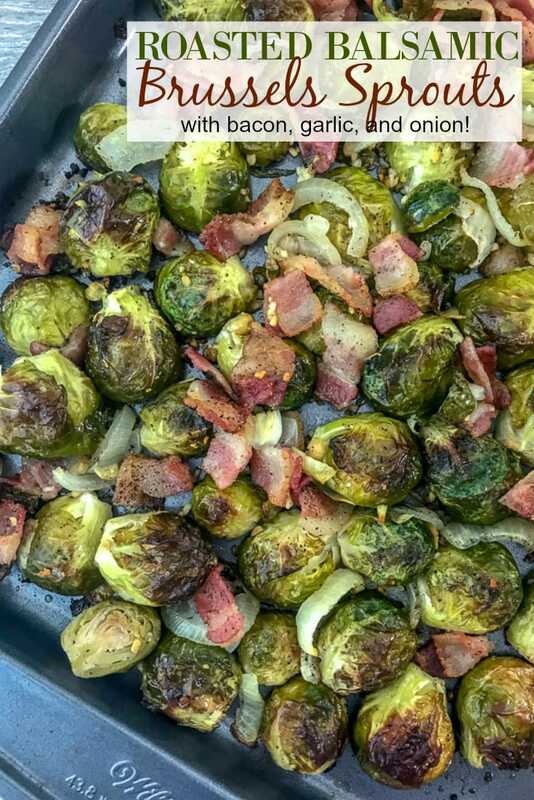 Toss brussels into a large mixing bowl with olive oil, salt, pepper, minced garlic, red pepper flakes (if using), and onion. Toss gently to coat. Add the sprout mixture to the baking sheet, turning all sprouts so they are cut-side down. Top with chopped bacon. Bake 20 minutes. In a small bowl, whisk together the balsamic vinegar and maple syrup. Drizzle balsamic glaze (homemade or store-bought) lightly and evenly over the sprouts, tossing them to thoroughly coat. Place back into the oven for 5-7 minutes, or until caramelized. Serve warm, garnished with salt and pepper (if needed). RED PEPPER FLAKES: Entirely optional. Adding a pinch or so will add a bit of heat to the dish, so if you're not a fan - simply omit. BALSAMIC GLAZE: Add to suit your taste. Start with 2 tablespoons and if it needs more, then add an extra drizzle when they come out of the oven. Same for salt and pepper -- all to taste!